With most of the job aids I’ve discussed on the Ensampler, I’ve focused on a main purpose–the job aid as primarily a reference or primarily a decision-guiding flowchart, for instance. 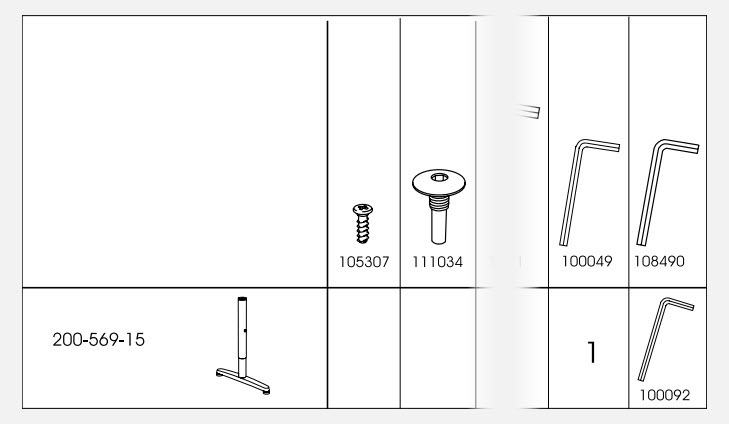 Here, I’m analyzing a familiar type of job aid: IKEA instructions. 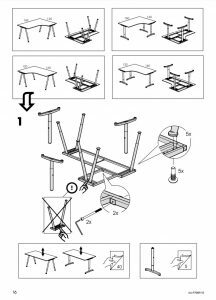 I’ve chosen the guide for IKEA’s Galant desk. The goal of this guide is to help someone attach legs to a metal frame, and then attach the frame to a desktop. The detailed procedural steps for your specific assembly. 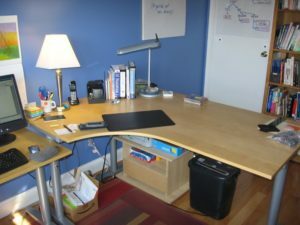 While IKEA’s Galant series of office furniture has been replaced by the similar Bekant series, I’m deeply familiar with the Galant; I had the corner desk in my office for years. That’s my old desk in the photo. IKEA calls it a left-hand desktop: one piece whose main, rectangular form curves into a smaller section on the left. I didn’t join any extensions to mine, but as you’ll see, all the tops were designed to match up with various extensions. For the desk you have, see the page indicated. Page 3 of the instructions is a wordless decision guide: based on the configuration you’ve chosen, turn to page X. 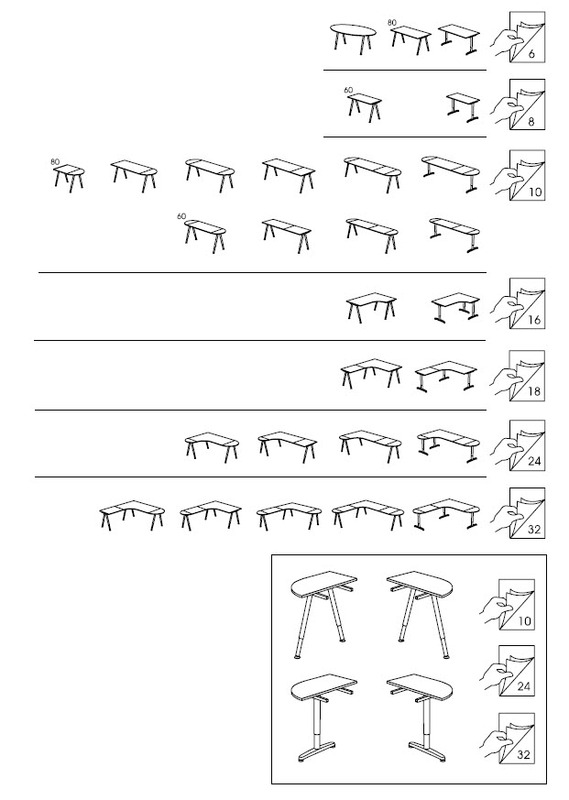 This page shows thirty-two different combinations of desk elements. Like a good reference, though, it organizes and categorizes. Each row set off by a line contains combinations that follow the same basic assembly steps. The third row down, for example, shows ten different combinations of desk that all follow the steps on page 10. You could find many approaches to organizing this decision. It’s not hard to imagine an product-centric one that started with the part number for each size of frame. What IKEA has done well here is to focus on the customer’s goal: a particular desk. The customer likely compared several configurations and so is likely to recognize the one he chose. 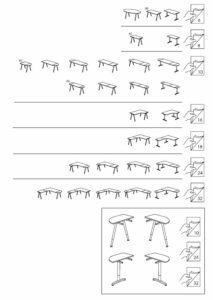 What’s especially helpful here is that IKEA relies on generalization: each row is a set of distinct items (the configurations) that leads to the same response (steps for assembly). It’s a checklist, dressed up like a reference. A checklist, because you choose the type of leg, frame, or extension you’re working with, and then read across to see how many parts of each type you need. The focus of a checklist is coverage or completion: make sure you have all these parts. 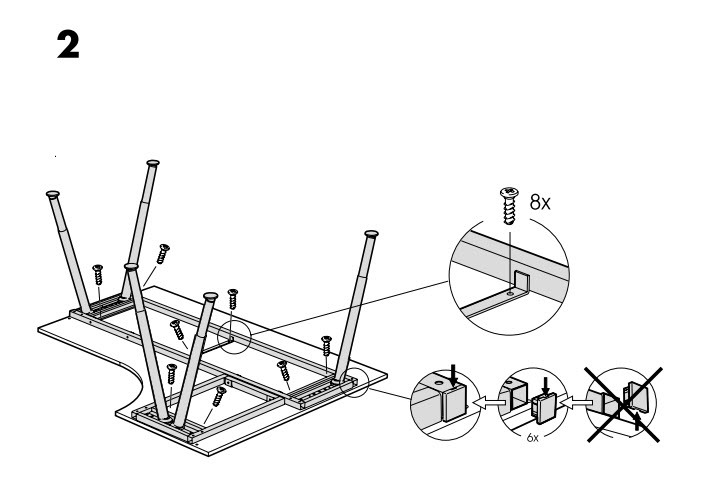 In addition, IKEA steps outside strict rules when it comes to parts for the T-leg. There’s a special size of hex wrench for these legs; it’s used to adjust their height. That size isn’t used for any other part in the Galant family, and so that specific wrench (100092) appears in the right-hand column, where you’d expect either a blank or a 1 (which would indicate you needed wrench 108490. I’m not sure I would have designed this chart that way, but I think it’s effective. Even if you hadn’t started assembling your desk, you’d be likely to say “I should have this particular wrench,” and it would have come in the package with the T-leg. 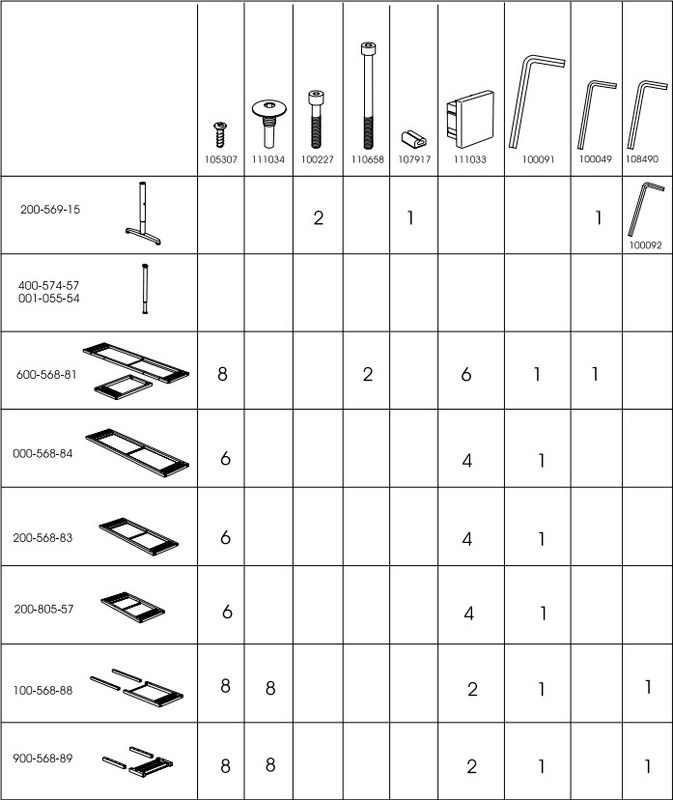 As I said, the parts chart is a checklist–but if you keep your IKEA instructions, as I do, it’s also a reference. Eight years after purchasing another piece of IKEA office furniture, I was able to get a replacement part because the original instructions told me what the part number was. To adapt Winston Churchill’s famous quip, IKEA may be the worst form of ready-to-assemble product design we have—except for all the others. 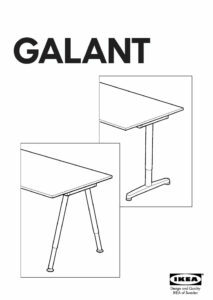 As noted above, page 3 of the Galant instructions is a decision guide — it directs you to one of seven different sets of procedural steps, depending on the type of desk you’re putting together. I had a left-handed desk with no extensions; that’s the fourth set of instructions, on pages 16 and 17. 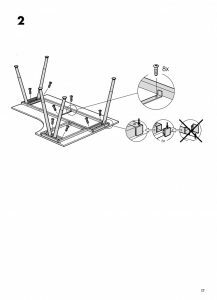 Implicit in IKEA instructions are two messages: “You can assemble this item,” and “Here are the details.” Those messages are related: if you don’t attend to the details, you’ll have trouble assembling the item. If you’re building one of these, you’re on the right page. 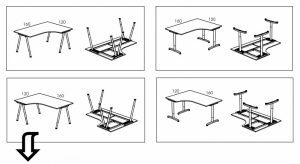 The diagram is meant to confirm that you want the instructions for a right-hand desk (top row) or a left-hand one (bottom row), whether you’re using five angled legs (left column) or three T-legs (right column). Each configuration appears both upright (because that’s your goal) and upside down (because that’s how it’ll look as you work on it). If you study pages 16 and 17, you’ll see that there are two main steps: attach the legs to the frame, and attach the frame to the desk. IKEA marks those with a big 1 and 2. The biggest drawback to IKEA’s wordless style is that there can be a lot of detail in a step. Here’s the main part of step 1 (page 16) to which I’ve added some callouts for commentary. The diagram shows both kinds of legs so you’ll see how to position them: for the angle legs, one in the corner of the desk and two at each of the remaining ends. For the T-legs, orientation matters, with the two on the long side of the desk parallel to teach other. A bolt goes through the frame into the angle leg. Note the closeup: there’s a small tab on the top of the leg that fits onto a hole on the frame. Also, the 5X is a reminder that you have five angle legs to attach. Some Galant desks are ordinary rectangles, but the right- and left-handed desks need support for their extensions. The closeup at C shows where two hex-head bolts attach the frame extension to the main frame. A pointing hand draws attention to the closeness of the legs for the extension. (Compare them with the two legs at the far end of the main section.) There’s even an X-ed out “not this way” diagram to reinforce the point. Position each angle leg and bolt it to the frame. Position the frame extension and bolt it to the main frame. At the bottom of page 16, you find two boxed items; each directs you elsewhere for a specific sub-procedure. 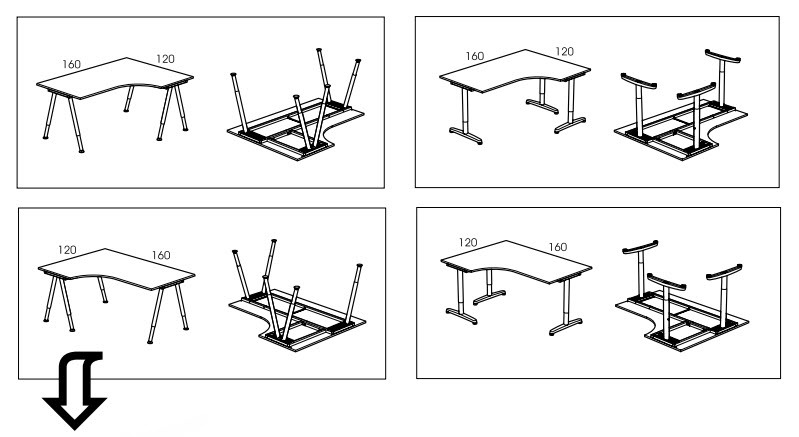 The left-hand diagram sends you to page 40 to see how to adjust the height of your desk, regardless of type of leg. Personally, I might have put this particular procedure on page 17, after you’ve attached the frame to the desk. The right-hand diagram sends you to page 5. That has the steps for assembling the T-legs and for attaching them to the frame. 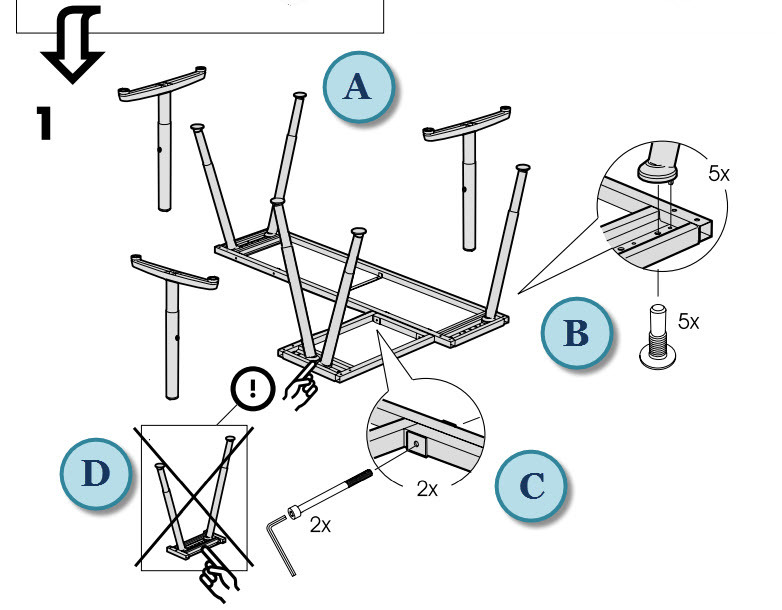 Attaching the frame to the desk is straightforward: eight screws, as indicated on the diagram. The less-obvious part of this step involves putting plastic caps over the open ends of the metal frames: four on the main frame, two on the extension. Why spend so much time analyzing a set of IKEA instructions? I think the Galant guide is a highly effective approach to supporting detailed accomplishments. IKEA’s worldwide market necessitates a wordless approach to such support. That has its drawbacks–I know I’ve misread IKEA instructions more than once. Almost always, though, I can back up, undo the error, and get things right. What’s more, the IKEA format is kind of do-it-yourself cultural artifact, and once you’ve put together a couple of IKEA items, you’ve learned through experience to pay attention to details like hole size, spacing, and position of part. By the way, there’s also a thriving culture of IKEA hacks–people going far beyond the instruction guide. Here are over a dozen hacks just for the Galant, including someone’s megadesk that’s 25 feet long, not including 12 extra feet of shelving made from yet more Galant parts. Malaria is transmitted to humans through the bites of infected mosquitos. WHO (the World Health Organization) estimates 219 million cases of malaria, and 660,000 deaths, in 2010 alone (last page in this summary). Rapid diagnostic tests (RDTs) provide a quick alternative to clinical-based diagnosis, testing for specific proteins produced by malaria parasites. Different tests have different capabilities; some can detect only only species of parasite, such as Plasmodium falciparum (hence “Pf test”). These tests are often conducted by local-community health workers. A key reason for the RDT is to shorten the time between the onset of symptoms and the beginning of treatment. This WHO job aid is a guide to performing such tests. Click the image to view in a separate window. Malaria Rapid Diagnostic Tests website. Correctly performing the generic Pf test for malaria. This involves using the materials in a medically correct and safe manner, as well as correctly interpreting the results to determine whether the test is positive (indicates malaria), negative (no malaria), or invalid (need to repeat the test). Health workers, often “in rural areas with limited access to health and laboratory facilities.” These workers may have low literacy and little formal training in the use of the RDT. They may also have minimal supervision in the field. Note that this job aid is a model; it would be modified to fit the local language, culture, and the specific RDT test. Thus in step 11, a callout reads “count correct number of drops” (of a buffer solution). In the field, location-specific job aids would presumably give the actual number of drops. I haven’t seen other examples, though. It may be that the buffer bottle spells out the number of drops clearly, and that the training stresses checking that number. Size: this is a large job aid. It wouldn’t fit on a typical letter-size or A4 sheet of paper. Instead, it seems intended as a poster, and could be mounted on a wall where the health worker conducts the testing. You’ll often see arguments that a job aid should be brief. That’s a relative term and often misleading. The essential characteristic of a job aid is that it successfully guides performance by specific kinds of performers. If they can’t succeed with a five-step job aid, maybe you need more steps. If you can’t fit the steps into a given size, then maybe that’s not the right size for that bunch of steps. Consider: two pages, a larger page, a reframing of a big job aid into three smaller ones (How to Set Up the Widget Modifier; How to Modify a Widget; How to Check Modified Widgets). A combination job aid: How to Do the RDT is mainly a procedure. Step 14, however, takes up 20% of the space, and supports the key accomplishment: a decision in the form of a diagnosis. That’s why, for the Ensampler, I’ve tagged this job aid under both categories. Step 14 provides specific examples for the two kinds of positive results (the line near T can be strong or can be faint), and for the two kinds of invalid results (no line at C and no line at T; no line at C and a line at T). Showing these examples is more useful in the context of this job aid than relying solely on “and / or” language in the text. One quibble about terminology: step 3 of the job aid refers to the test, not the cassette or the test cassette. The only place cassette appears is in step 16. I might have made different choices for steps 15 and 16. 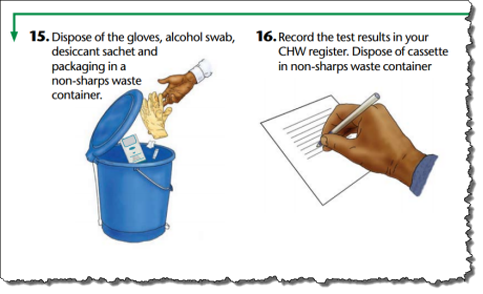 Discard the gloves, swab, desiccant, and packaging (step 15). Record the test results (first part of step 16). After recording, discard the cassette (second part of step 16). I assume that good practice says “write down the results before you discard the test cassette.” If that’s the case, it might make sense to underscore discard-write-discard with a new step 17. It would look like step 15 but with an image of the cassette. The home page for the Malaria Rapid Diagnostic Tests. 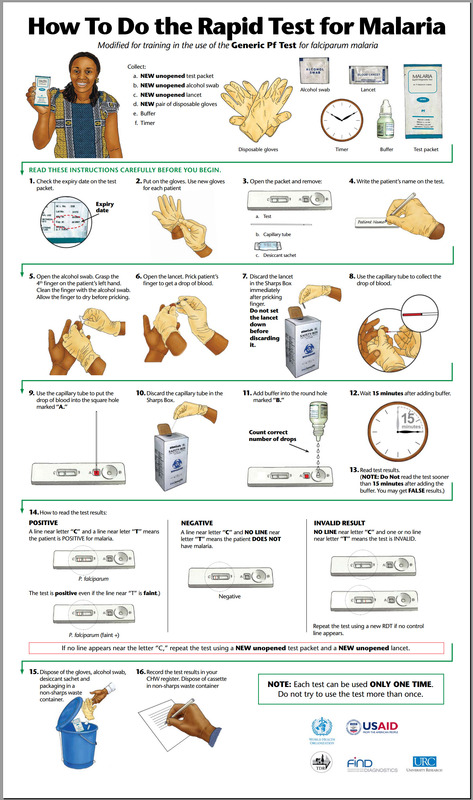 A field report on developing and testing a job aid for RDTs, prepared by the Quality Assurance Project in collaboration with the World Health Organization (2004). Identification of a type of wine based on factors like overall type of grape and preferences regarding taste. Wine is all about taste, and as a sommelier, my job is to lead customers into wine they want to drink. Most do not know what they like; they just know they want red wine or white wine. This novice level need is how I built the first level of the flowchart. Beyond the first level is all about flavor affinities… For instance, if you like black coffee, you’ll probably like a bold wine with high tannin. If you prefer a latte, you might lean more towards a round and lush syrah. Presumably a customer choosing wine. Although the example that Puckette gives above is in a restaurant setting, her level of skill would enable her to guide the customer from memory, so it’s not likely a job aid for a sommelier. A customer curious about or considering a wine, either in a store or online. Restaurant wait staff, possibly practicing with a subset of the information, in order to increase their ability to guide patrons in the absence of a sommelier. I’m usually not a fan of the infographic format, especially if presented as a job aid, because most such graphics by virtue of their size are impossible to use on the job. Wine Folly’s chart, though, isn’t meant to be the final word on wine selection. From Madeline Puckette’s point of view, it’s a way to help people toward an enjoyable experience with wine. For the purposes of the Ensampler, it’s a highly concentrated way to organize a great deal of information with the goal of a satisfactory outcome. Someone who knows wine understands the differences between a Rhône and a Pomerol, even though both are in the red / savory / black pepper cluster on the chart. At the same time, that person would probably agree the two are closer to each other than either is to a Médoc. He’d also likely agree that if you say you enjoy the taste of black pepper but don’t care for things that are too spicy, a Rhône rather than a Bardolino isn’t a bad choice. Underlying the design of the chart is the basic when/then type of consideration that goes into building a flowchart or a decision table. Here’s a sample of what I mean–a portion of the “savory red” section of the chart. For simplicity, I’ve included only four wines in each category. Turning the entire Wine Folly chart into a decision table would produce one lengthy, complicated table. 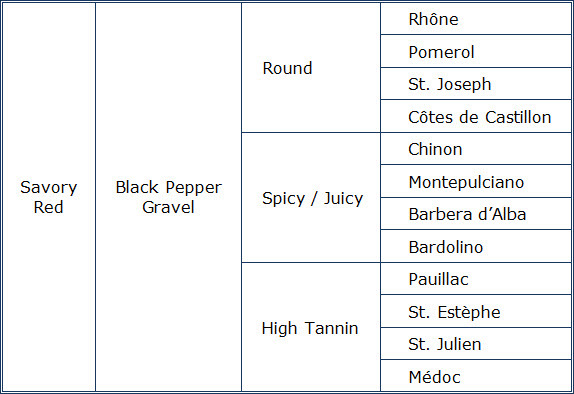 That’s due to the multiple factors: grape/ overall type (like sparkling); what I’ll call ‘style family’ for a grape (like sweet, savory, or fruity for red); flavor characteristics within that family (the small red circles in the Wine Folly chart); and finally characteristics like tannin versus spice versus roundness. I’m very grateful to Madeline Puckette for sharing the thinking behind her chart, which I’ve tagged both as decision table and flowchart. Sure–the essence of a job aid is not the form it takes, but that it provides guidance to someone who’s completing a particular task. In that sense, many software wizards and widgets are job aids: they enable accomplishment that would be difficult or impossible without them. Most decision tables lead to a specific action–file this form, start that process. This one takes a different route. In a way, it’s a quick substitute for a conversation with a CIC official, the person who’d be making a decision about your status based on your answers to the question. That’s one reason I’m putting it in the Ensampler: it shows that you can use the job aid approach to help the clients of an organization, as well as its employees. Note that there’s a legal disclaimer on the page: the tool “is intended solely for general guidance and reference purposes.” In other words, even if the tool says you might be a Canadian citizen, some nuance or technicality can crop up. Determining whether you’re already a Canadian citizen. This could lead to additional actions, such as deciding to apply for a certificate of citizenship or a passport. A person who believes he or she might be a Canadian citizen–for example, someone like myself who was born in Canada but lost Canadian citizenship as a child when his parents became naturalized citizens of another country. Have you ever renounced your Canadian citizenship with Canadian authorities? Typically a job aid doesn’t explain why a step is performed. In this case, however, the online tool provides explanation for a technical term (renunciation) to help a person answer correctly. Was your Canadian citizenship ever revoked for fraud? Between January 1st, 1947, and February 14, 1977. At the time of your birth, was either parent employed by a foreign government in Canada with diplomatic status? Based on your answers, you are likely a Canadian citizen. For a formal assessment of your citizenship status, you have the option of applying for proof of Canadian citizenship. As CIC points out, for people who were born in Canada, an official birth certificate from their province or territory is often sufficient to prove citizenship. Those individuals, as well as people born outside of Canada, can also apply for a citizenship certificate. Based on the information you provided, it appears that you are not a Canadian citizen. That was followed by a list of seven possible reasons (e.g., “you are in the second or subsequent generation born outside Canada to a Canadian parent on or after April 17, 2009”). So regardless of your citizenship status, the tool doesn’t pretend to give the ultimate decision; it simply explains what’s likely to be the case. Background: I created this decision table based on information from FEMA’s National Flood Insurance Program. The purpose of my table was to demonstrate, in a presentation on using job aids, how this arrangement can guide people through a series of decisions and have them arrive at an appropriate answer. Rating (figuring out premiums) is chapter 5 of the NFIP Flood Insurance Manual and comes to more than 60 pages in the most recent edition. Even so, an insurance agent who wants to calculate the correct premium can make use of tables to determine (a) the property’s flood zone, (b) the specific type of property, (c) the coverage [desired amount of insurance], and finally (d) the premium based on the actual coverage. I’m pointing this out to emphasize that you shouldn’t use my table to figure out what your flood insurance might cost. You can use it as a simplified example of a decision table, though. Just an example, not an actual rate quote. What’s the accomplishment? A quotation for the annual premium for flood insurance, accurate based on the type of property, the desired amount of coverage, and the overall limits for coverage. Who’s the performer? An insurance agent writing a flood insurance policy under the National Flood Insurance Program. As noted above, this is a simplified example used in a discussion about types of job aids. It’s not meant as an exhaustive guide to determining flood insurance premiums. What type of property is this? 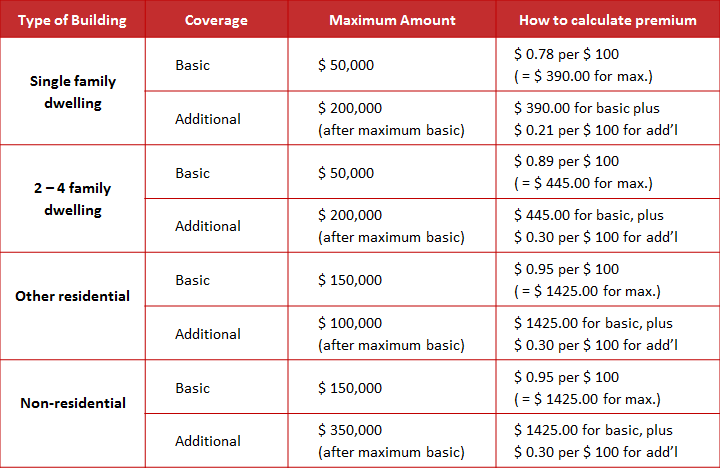 During my recent presentation at the CSTD conference in Toronto, a volunteer using this job aid was able to describe correctly how she’d calculate the insurance premium for $150,000 of coverage on two-family duplex ($445 for the first $50,000, according to the table, and $0.30 per $100 for the additional $100,000). Even if she’d been incorrect, just a little feedback on how to compute the premium would have been sufficient for her and for all the other participants to calculate any amount covered by the chart. In fact, when I asked if I could get $750,000 in coverage for an office building, several participants immediately said no, because the maximum coverage for commercial property is $500,000. That’s a pretty good example of how a job aid improves the effectiveness of training.